The first step is admitting you have a problem. So...I have a fear of crop tops. There. I said it. I have never plucked up the courage to wear one. The idea of having my stomach out on show terrifies me to my very soul. However, I've made steps for change. I recently bought two crop tops which I plan to wear on my holiday in just over a week. It took a lot of guts, but I realized that it isn't that scary after all. Crop tops look great and I always envy people wearing them. So, if you're like me and have been too self conscious to grab a hold of this trend, then I say DO IT. DO IT KNOW. There's no need to worry. 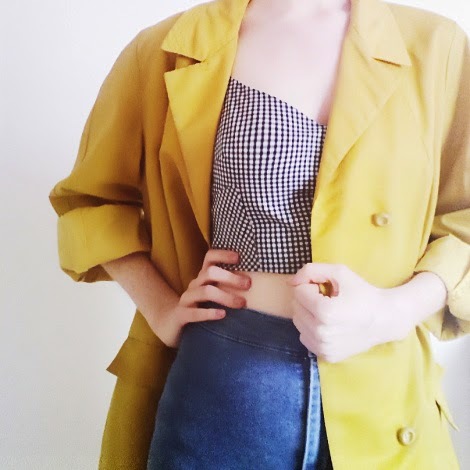 Pair a crop top with high waisted trousers, shorts or a skirt and there therefore becomes nothing on show. Wear a crop top with a bikini and shorts on a sunny holiday, you're only keeping cool. Wear a crop top with a vest underneath, keep it casual. There are so many ways to wear a crop top and not feel uncomfortable or conscious. BE CONFIDENT and eliminate the crop top fear.